Laconia is a fun city to visit in the Lake Winnipesaukee area of New Hampshire. At one time, it was a part of Meredith and Gilford known as Meredith Bridge. It was incorporated as a separate town in 1855 and then established as a city in 1893. This town is the ninth largest city in New Hampshire and is situated near three lakes: Lake Winnipesaukee, Lake Winnisquam, and Lake Opechee. It includes the villages of Lakeport and Weirs Beach, often referred to as "The Weirs," which is a popular tourist destination on Lake Winnipesaukee. Here you'll find the historic Belknap Mill which is the only industrial knitting museum in the U.S. The Mill has been restored and has become a popular cultural center in the lakes region. Throughout the year, the Belknap Mill offers concerts, exhibits and local performances. Reviews of the Laconia New Hampshire area. One of the largest attractions is Bike Week. It is the oldest motorcycle rally in the country. Each June, thousands of bikers motor into Weirs Beach on Lake Winnipesaukee in New Hampshire. You'll find demo rides, bikers contests, the hill climb, vintage racing and so much more. If you're looking for peace and quiet then this isn't the time to visit Lake Winnipesaukee. On the other hand, it's something a lot of people want to experience. Even if you don't ride, bike week can be a fun and memorable event. 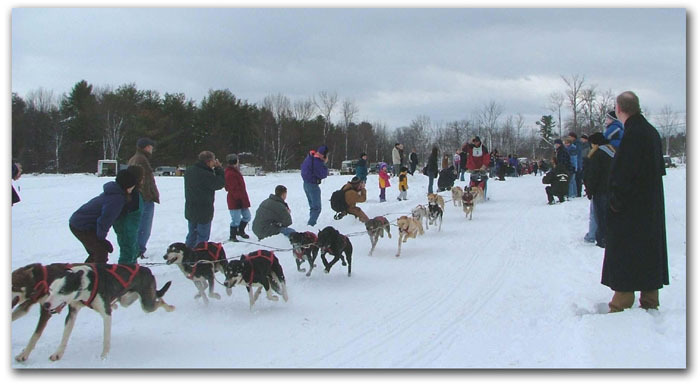 If you like sled dog racing, then you won't want to miss the World Championship Sled Dog Derby. This event is held every year in February. The race first began in 1929. It then became an annual winter sporting event in the Lake Winnipesaukee area. Crisp, winter air, snow on the ground, people milling about. It's the perfect setting to watch the sled dog race. You'll find concession stands, a winter carnival in the downtown area and local camaraderie to round out the event. Grab your hot chocolate and enjoy the race! So book your hotels and travel on up to the Lake Winnipesaukee area for a fun time no matter what season you choose.